You already know that I have an issue with cake stands. I have those three lovely pressed glass pieces that I picked up at various flea markets. I have a couple sets of highly functional Anchor Hocking glass stacking tiers that I purchased for my sister's wedding buffet (those are boxed up in the attic, because they aren't used often, being practical rather than gorgeous). But people, I can't stop. My parents purchased me the diminutive scalloped edge stand for Christmas, and I've been keeping it in the center of our table, as a showcase for little treasures (recently, my antique tea cups). I found the tall jadite beauty on Ebay and I had to buy it because I'd seen the same one in an antique store and nearly keeled over when I checked the price tag and saw that it was $120. I tracked it down for $50 (including shipping) and decided it would be my Christmas gift to myself. And then Daily Candy had the audacity to send me an email about a 30% off deal at Layla Grayce last week and I found this ruffled, oversized one that screamed at me and forced me to buy it because it was such a good deal. Here's the thing - I live in an apartment. An apartment that cannot be filled to the brim with cake stands, no matter how beautiful they may be. I can see only one solution. I need to start a dessert business that involves displaying things on cake stands. Then my obsession would be a justifiable business expense. Right? Until then, I'll just content myself with taking lots of pictures of them. Rachel- you have a wondeful collection started! Yes a bake shop would be perfect! Do you have room on a wall for a simple shelf to display them? You have my vote- keep collecting!I love cake stands too. I have a small collection going. My favorite vintage are the small stands that fit almost in your hand. Vintage, artist made and new cake stands they all are pretty. Beautiful! I received two cake stands for Christmas, and I must say, you're making me want more. I have a new obsession with jadite and drooled when I saw this beauty. Now I might have to go back and buy that creamer I saw saturday. these are gorgeous. i think since you use cake stands for various things (cakes, oranges, teacups) then you're completely justified in buying so many! they're truly beautiful and add such a whimsical feel to your dining room table. This post made me giggle! But seriously, it sounds like you have a calling--maybe you should make cake stands. Cake stands are grand, agreed. There is something about them that just says "tada!" I vote for keep collecting. Look at how bright those oranges are! Lovely. You definitely should. Why don't you set up a dessert stall selling coffee and cookies at one of those flea markets you are always going to? These are beautiful images! Just breathtaking! 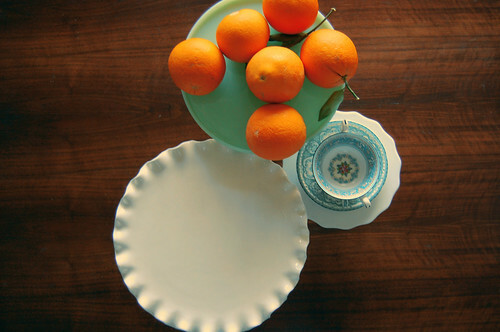 I love your jadeite pedestal, it's perfect with those oranges! I just started my own collection of cake stands this Christmas (...only one so far) but now I am inspired to go out & hunt for more! thanks, Rachel- you always have such beautiful ideas! 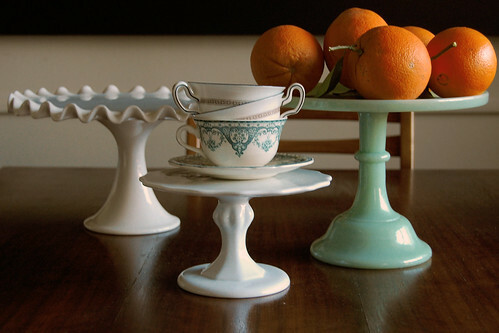 Oh so wonderful - LOVE your cake stands! Just hid them under the bed if you start running out of room! UM, yes. You should start a dessert business! Did you say you're a scientist? What kind??? Neat. My parents are both scientists. Also, you are reinvigorating my search for perfect cake stand. Even though i rarely bake cakes. still. a girl needs to have one just in case. on those gorgeous cake plates. I see no reason why an apartment cannot be filled to the brim with cake stands. No reason at all. Oooh, Rachel, you have a beautiful obsession! I think we would all love if you started a desert company! Plus, cake stands are WAY practical because they can be used to display anything, from food to even a soap stand in your bathroom. However, I must implore that your future photos not be so CUTE because I want to run out right now and scour for a cake stand. And at least this collection doesn't take up as much space as other things might. For example, I bring home chairs like some people bring home stray cats. I can't stop myself and we now have WAY more chairs than we have space for! Wow! These are so beautiful. You are brilliant to display your teacups on the stand like that--you are an incredible stylist (and photographer)! I totally have cake stand envy! Hooray for cake stands! I've been on the search for the perfect one. I saw one today at an estate sale, but it was $125. Boo. I'm thinking about finding one with a glass top and turning it into a terrarium. We'll see. Thanks for the inspiration! Oooh! I vote for starting a business. Talk about deliciousness layered upon deliciousness! That jadite stand is beautiful! Lovely pictures, there is definitely something about cake stands that makes them so special and covetable! What a wonderful collection you have going! I think it is great you are using them for display like that. love all the cake stands...!!!! I say, Keep on with your bad self! If you will regret not purchasing one, you'd better snap it up. Plus, you take lovely photographs of them ... So, collecting cake stands satisfies your masses! i love cake stands too. in fact i believe one can never have enough of them. unfortunately my counter space/storage space/husband tend to disagree. ah well. one day they will all come in handy. i know the will ").